Complete Book of 850 Years Predictions by Hazrat Naimatullah Shah Wali (R.A.) with a lot of explanations and summary of future predictions (at pages 53 to 57) compiled by Nawabzadah Niaz Dil Khan is posted below. Interestingly, it has a suggestion at Page 57 for which this whole blog can provide a wealth of spiritual knowledge about future. 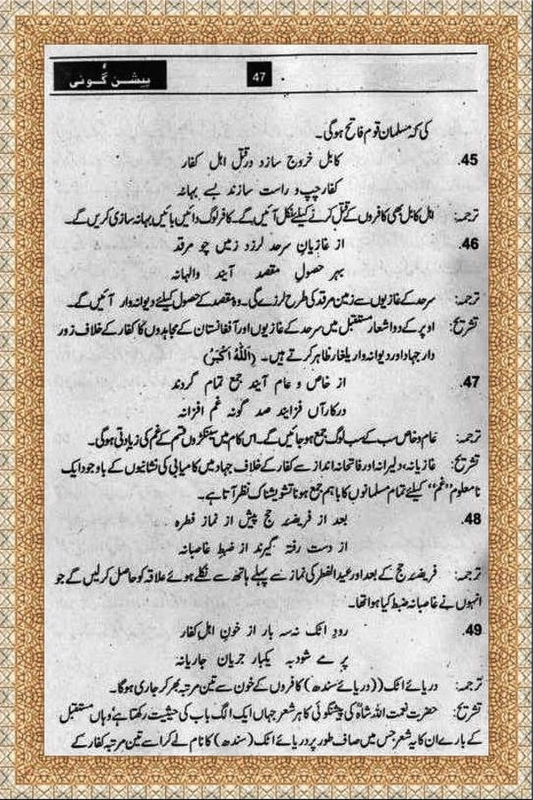 In the end, there is a compiler's suggestion for Pakistan’s present and coming Ruling elite, Politicians, Generals & Commanders of all three Armed Forces in particular and public in general that the Predictions of Hazrat Naimatullah Shah Wali (RA) demand utmost importance and extreme seriousness. For this, it would be a wise and visionary step to develop a separate research cell or "Prophecy Research Center" in G.H.Q so that in the light of these spiritual and divine prophecies (and beforehand intelligence); battlefield tactics, warfare planning, and a multi-dimensional strategy could be developed along with conventional military training and materialistic resources to deal with the challenges of coming time. Similarly, PhD students can select this topic of ‘Prophecy’ for their thesis whereas this subject is open for advance level research by Professors/Researchers. 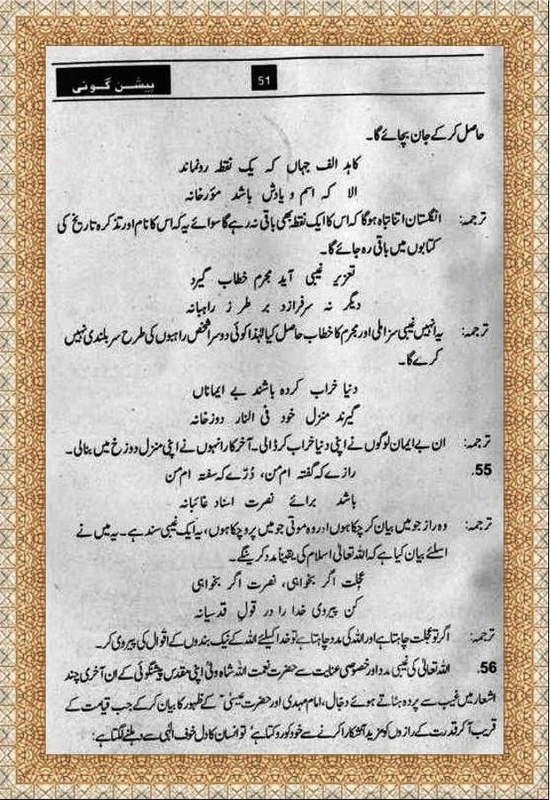 Admin Note: Above suggestion is exactly in accordance with Allama Iqbal and Jalaluddin Rumi (R.A)'s words of advice and recommendations in their books. 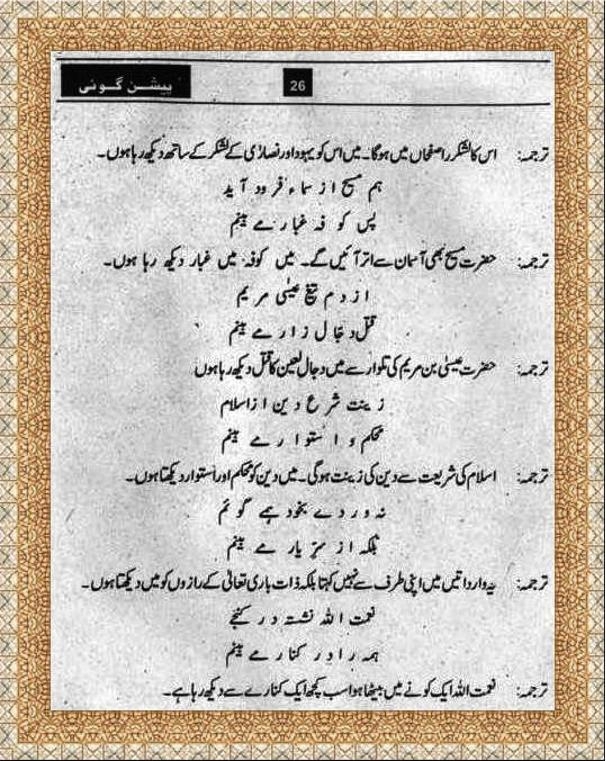 Allama Iqbal again and again stressed Muslims to make their vision sharp (A verse from Javed Nama). True sight signifies seeing the Truth. Dissolve the whole body into sight— . 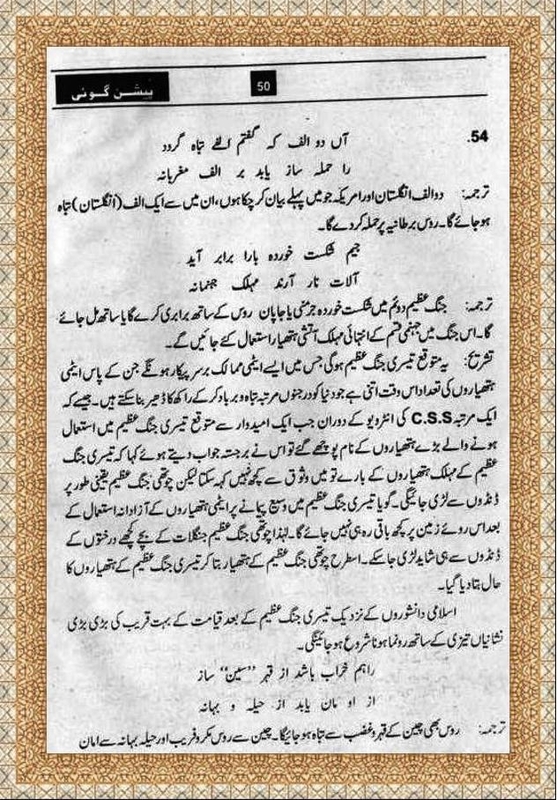 Go to gazing, go to gazing, go to gaze (Basirat)"
There is a prediction on page 22 regarding sher ali shah, now watch this what dr Israr Ahmed is discussing about maulana Dr Sher Ali Shah!! His prediction is very startling but the Tashree is extremely one-sided and shallow. Whats your suggestions about 'Prophecy Research Center' or any other similar research center? 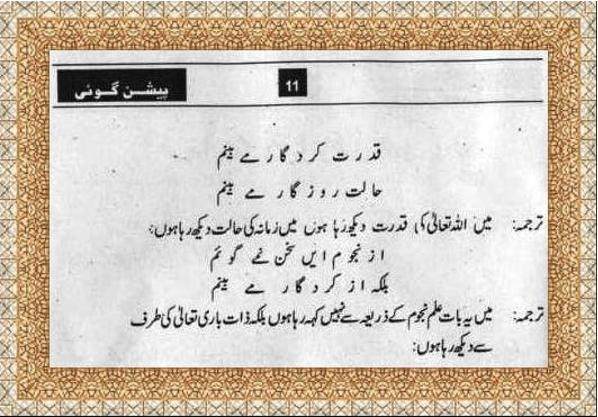 Believe me, purpose of this blog to give vision to the desperate people and Allama Iqbal recommended such vision, there are hundreds of Ashaar which I can put in support of my argument even from Masnavi of Rumi and it is in accordance with Quran and Hadith (I am talking about spiritual foreseeing, not astrological etc). InshaAllah I will post about this. This is an excellent suggestion. There is much circumstantial evidence that Jews in particular and Christians and Hindus in general do act on the predictions and prophecies of their scholars. There should be NO shame in developing our national policies and political approach based on spiritual intelligence. If non-Muslims can do the such a thing, why we can't. Moreover, it will help us protect and defend our national interests. 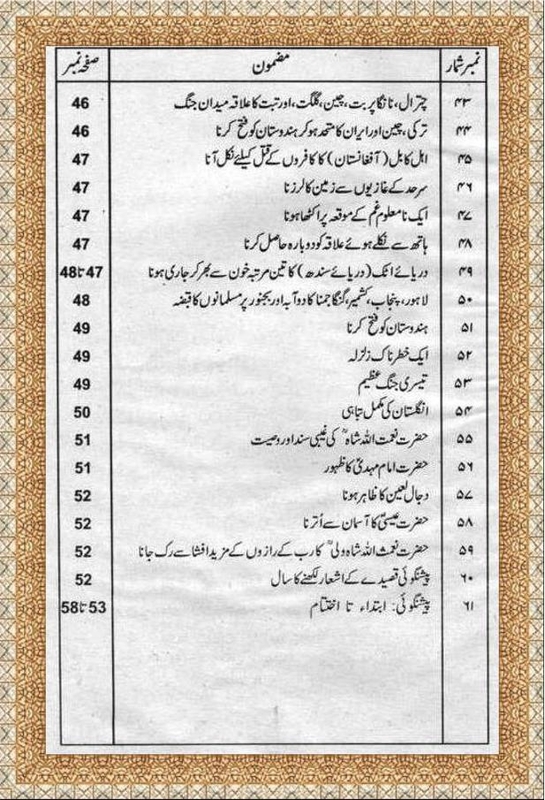 Brother, You download 'Naimatullah Shah Wali Predictions Book' or download pages and print it. online hi perh lain, buy kyun kerni hai? 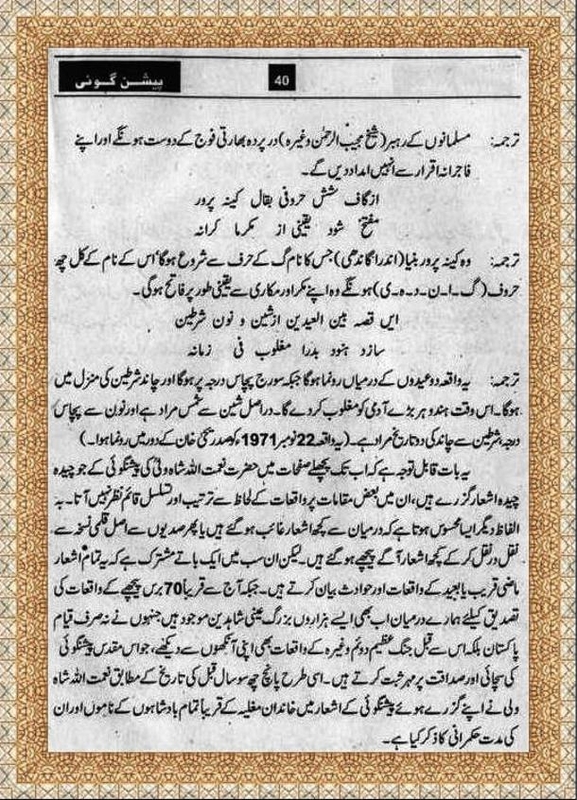 this is the video in which Dr Israr Ahmed is discussing about Maulana Dr Sher Ali Shah, plz watch it! 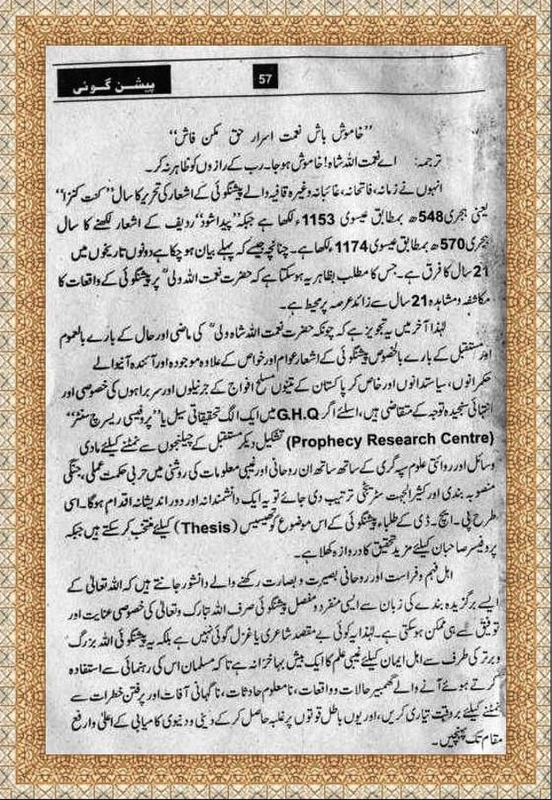 Research centre for Prophecies in GHQ?? Pak Army is the ultimate mercenary army which only kills muslim fellow countrymen. 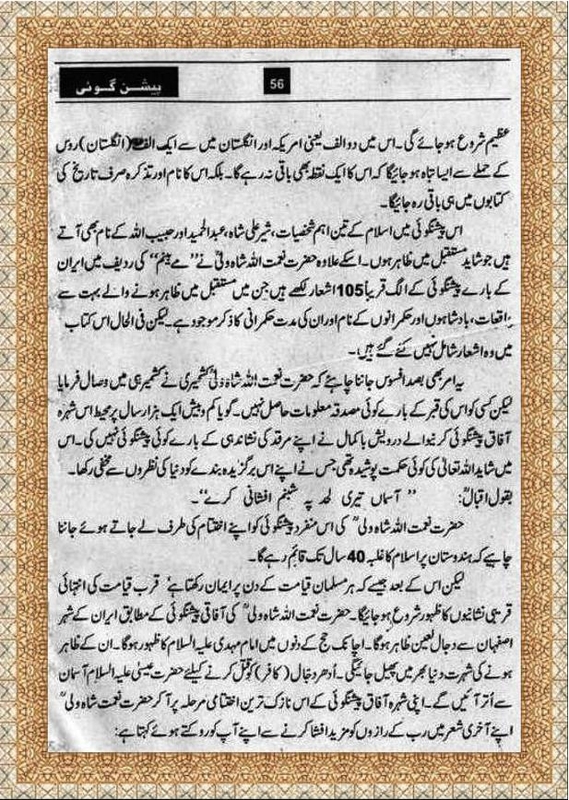 The writer must be a bhola who don't know the pakistan army and it's actions against muslims. Both of you are ignorant who do not see the killings of innocents by terrorists (TTP and BLA) and blame on PAK Army. Shame on you, and Allah show you light. i agree. Fifth column of an enemy works to weaken our belief in our institutions and to create doubt about their integrity. Think for a moment there is no Pak Army, where all these wisemen be there to pass such comments...In a weak society, Pak Army remained the only stable organisation facing all fronts. If you are not Khwarij then search who is playing football with heads and kill innocent people by bombing. Jab geedar ki moat ati hai to wo shehr ki taraf dorta hai, tum dono kutto ki moat qareeb a rhi, as in predictions, it was predicted, lihaza tm pak or pak army k khilaaf bhonk lo..
haha. agar GHQ main research centre ban gaya to sari news awam ko mile ya na mile, sab se pehle US consulate zaroor puhunch jain gi. baat toh sach hai,magar baat hai ruswai ki. AWAMI TEHREEK EHTESAAB. naam se to yeh army ke paltu lag raha hai. aisi organizations sirf awam ko ullo banane ke liye bantin hain , in ki nazar khabees fouji elite par kabhi nahi parti. lanat on pakistan army and civil establishment. Lanat ha tum dono pr, by garto apni army ko hi batin krty ho. 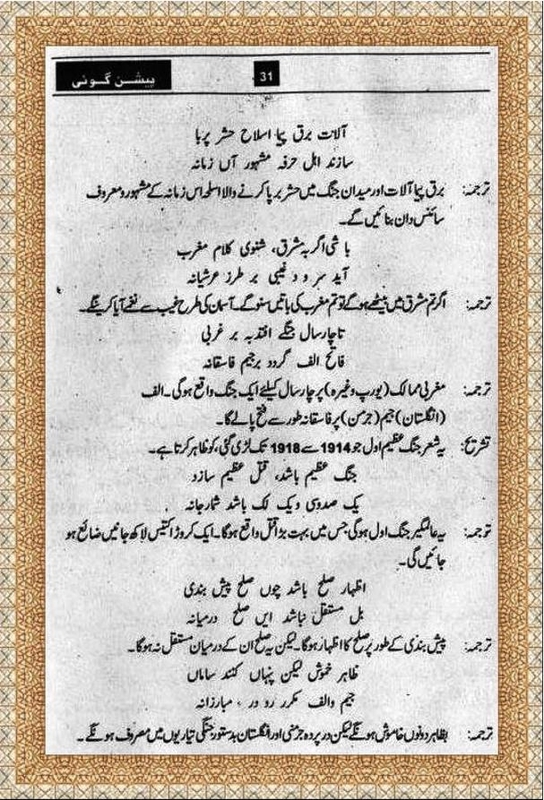 Lanat on those who curse Pakistan Army and ISI, the only institution running efficiently, effectively, professionally and giving sacrifices on daily basis. 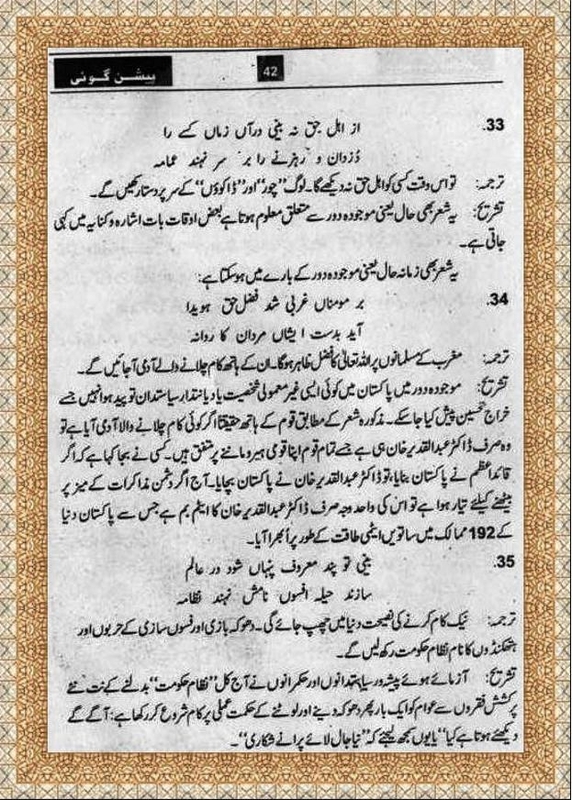 On the ignorant who hide under Anonymous names talk nonsense against Pak Army which despite some faults is still pride of nation and us destined to greatness in fulfillung ghazwa e hind event. What about ordinary East Pakistanis who got caught up? Listen you moron, what do you know about this mercenary organization?. Have you ever experience the pain of those people whose relative has been abducted and then killed after torture by your napak fouj?. You better ask them about your sacrificial institution what they think about them. Your napak and western slave army killed and abducted hundreds of muslims and gave them to US forces. "Pakistan Army has committed no such crimes against it's own people as alleged by idiots to confuse And divide Pakistani nation". What a dumb idiot you are, its your army whose napak officers were involved in killing of innocent bangalis, army involvement results in breaking pakistan. Its not people like me who divide pakistan. About the video: please don't make me laugh more by watching zaid hamid. Secondly, you are blind hate for Pak Army compels you to repeat the propaganda of Americans and Indian against Pak Army while sparing the corrupt politicians who have destroyed every institution like Railways, PIA and produced the artificial scarcity of electricity, gas and water while filling their own coffers with dollars from their American Masters and begging for their help just to prolong their stay in govt. Your hate prevents you from seeing the sacrifices made by Pak army for Pakistan and you love for western democracy instead of Islam allows you to ignore every atrocity by corrupt Pakistani politicians. Again you have blindly quoted the propaganda of India on 1971 accident but you will never believe another Indian "Sharmila Bose" who has dispelled all the allegations on Pak Army by Indian propaganda machines saying that these are baseless lies. 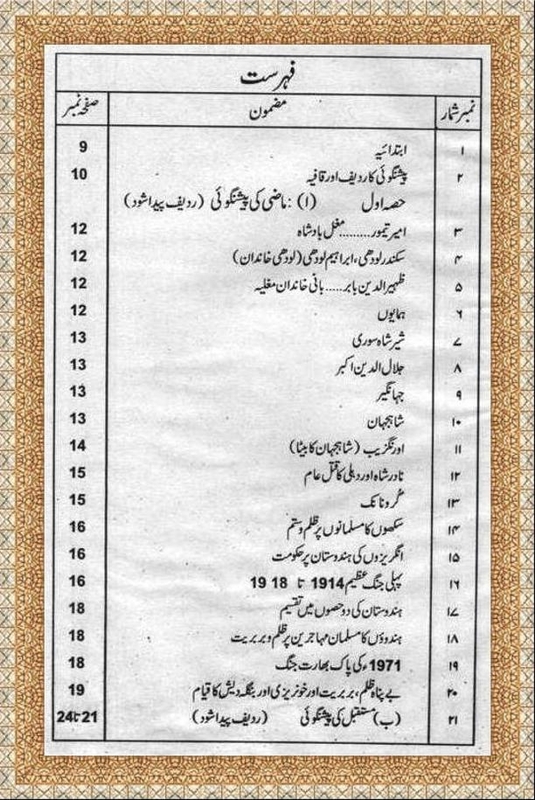 Why would we believe your baseless claims when the book by Qutubuddin Aziz clearly narrates the accounts of 170 eye-witnesses of 1971 accident in his book "Blood and Tears" which rejects any such crime committed by Pak Army against the Bengalis . 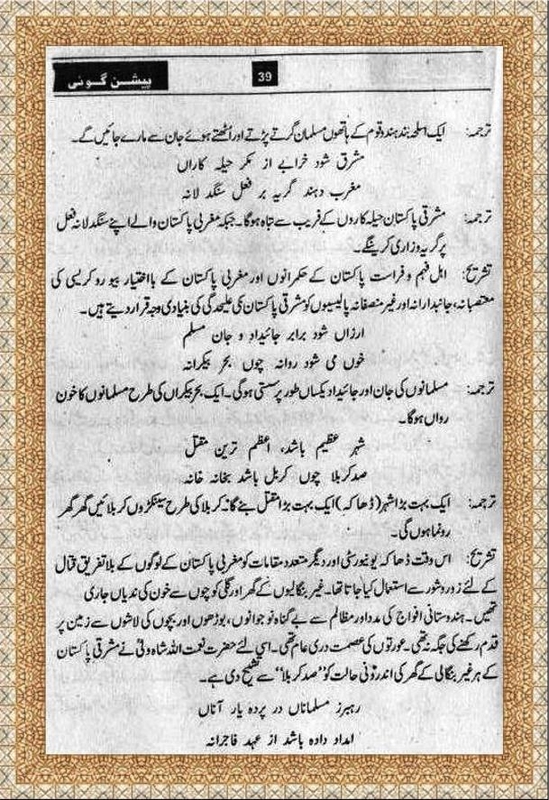 But you hate for Pak Army will make you reject this historical document without a valid logic!!! 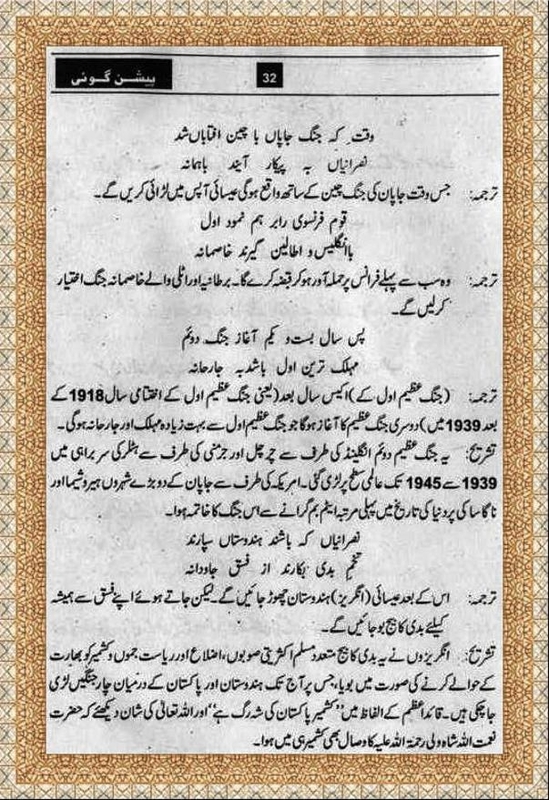 It is the people like you who fall for every allegation of Indians against Pak Army BUT never raise you voice against the cowardly act of invasion of East Pakistan by India without any reason. 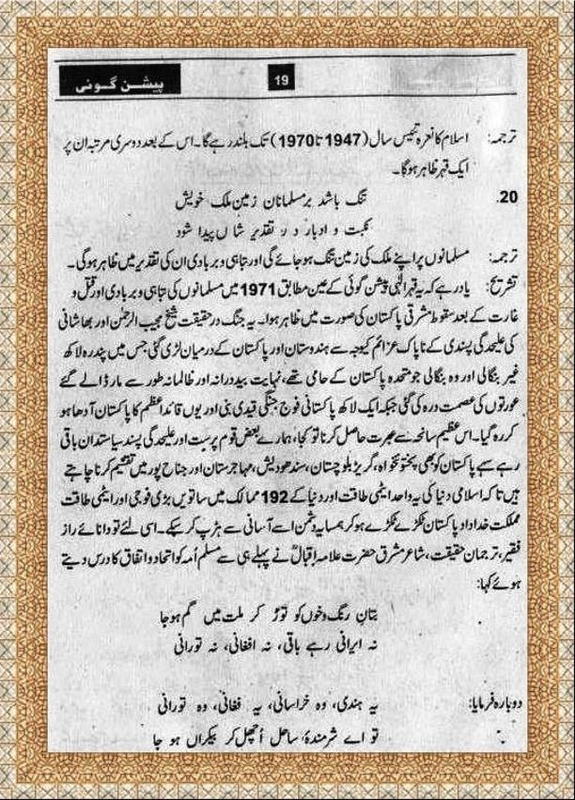 It is the people like you who stood up with Mukti Bahni instead of Pak Army in 1971 and you are using the same approach today. Biased people like you can only laugh at the Zaid Hamid and other patriots because you have nothing to say in reply to their questions and facts. Instead of contributing the blog with something creative, you are just spreading your internal filth here and there. i agree with you in this regard since there is no more powerful and corrupt authority in Pakistan than army.Its a state within the state.In fact the whole state is an army state. What about those civilians who are being killed by BLA morons? You must be TTP moan who are killing innocent people in the name of your kind of religion. @COCO URF ANONYMOUS Stop babbling; you Indians have got nothing more to do than spread filth on others' forums. Just wait how this PAK (what you called Napak) foj removes the state of India from Earth. Just wait and watch. #coco you are paid dog of enemy.. You all Assholes will be killed kuttay ki moat, these prophecies are setting fires on your asses.. we do understand. Mind your tongue. Pak Army and ISI are the only institutions that are patriotic and working to save Pakistan from hypocrites like you. 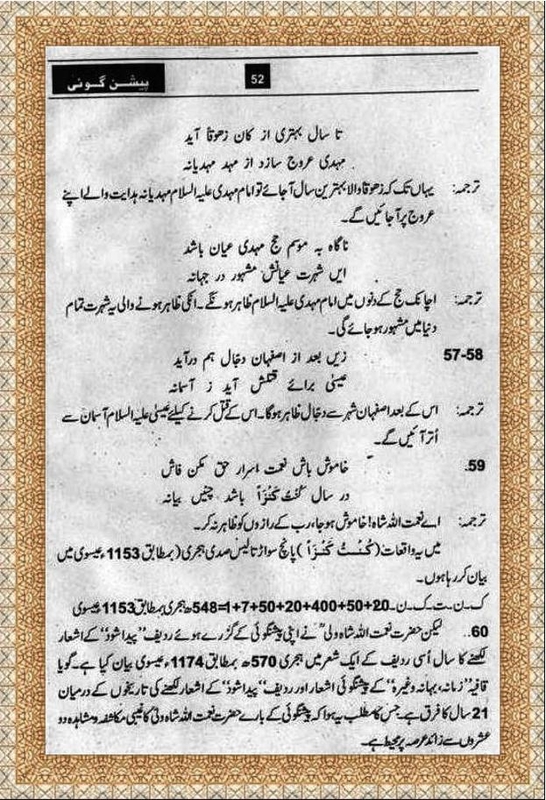 Ye wo log hain jo mulk ki khatir apni jaan qurbaan kr rhy hein. Talibaan khudkash hamloon main kitnay fauji jawan shaheed ho chukay hein. Unhn ny boht qurbaniaan di hein. Aj b jb mulk main koi aafat ati hy, (flood ya earthquake) tu ap log army ko hi awaz detay ho k a kr hmari madad kro. Ap ki civilian govt. kyn nhi kuch krti. Wo corrupt politicians tu in situations ma b corruption sy baaz nhi atay. Shame on such people. Aur jahan tk baat hy k Agencies logon ko utha kr ly jati hein. Ye bilkul galat hy. CIA, MOSSAD aur RAW k cooperation sy kuch organisations aur political parties ye kaam kr rhi hein. Aur media walay b un k sath mil kr naam ISI por lga detay hein. Hmaray mulk ye aasteen k sanp hi barbaad kr rhy hein aur ap jesay log in ki baatoon mein aa kr apnay Pak watan ko nuqsaan pohancha rhy ho. Hmari agencies walay agr kisi ko arrest krtay hein tu wo solid proofs ki base pr aesa krtay hein. in agencies k officers py b check and balance hota hy, jo koi galat kaam krta hy usy punishment b milti hy. Lekin kuch munafiq log aur foreign aided NGOs mil kr Pak Army aur ISI ka image kharab kr rhay hein. koi jaan waan qurban nahi ker rahay.buzdil hain yeh log.apne 20,25 log shaheed huey toh maa yaad aa gayi,aur awam k 20,25000 marnay pe b koi action nahi.wah g wah! mulk ka 70% budget army khati hai.uss budget ka major portion ka audit bhi nahi hota.inn k bachay a.p.s,garrison,behria,nust aur dusray institutes mein muft parhtay hain.Cmh mein inn ko nawaboun wala treatment milta hai. 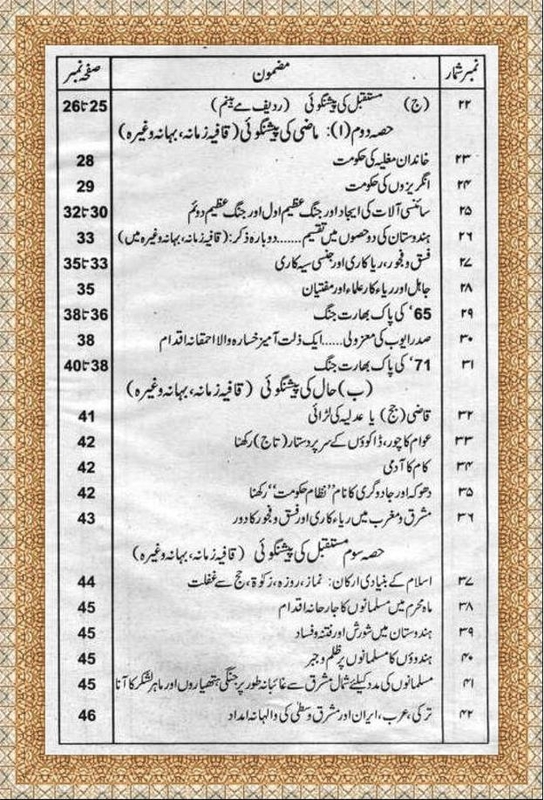 defense housing schemes.retirement pe plots waghera. inn ki toh panchoun ungliyan ghee mein hain bal k yeh khud he puray ghee mein hain. aur phir b agar koi corrupt hai toh politician .wah g wah. abhi thoray dinoun pehle transperency international ki report ayi thi jis ne army ko Pakistan ka 5th most corrupted institution kaha tha. i'm sure k agar saray funds ka audit hu hota toh army #1 hoti. Sorry, are you guys saying that the actions of 100% of the army including its leaders had absolutely nothing to do with the secession of half our Pakistani brothers & sisters? If you learn nothing from that, you will repeat the mistakes, leaving Pakistan as just one individual! 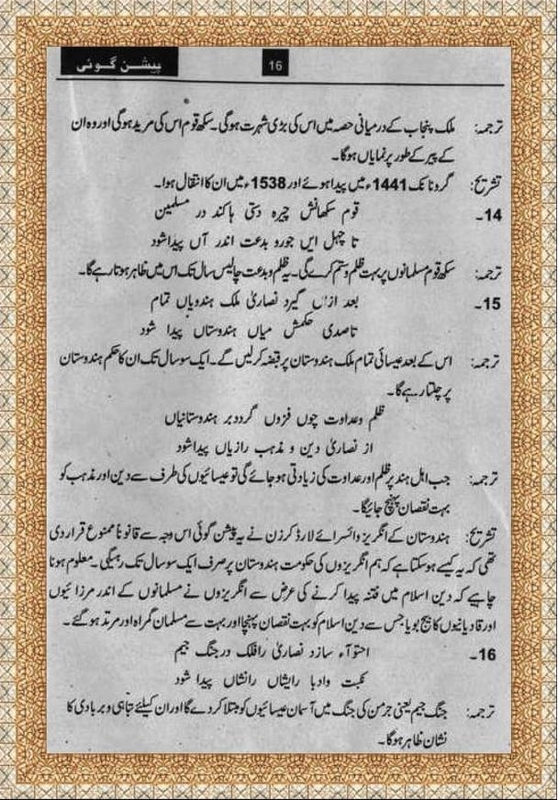 i think ghazwa e hind will be fought without atomic weapons .indian army chief recently commented that atomic weapon is a political weapon not to be used in war.it seem evident that pakistan air force will be of no use in this future war since indians will be upto river attock(sind).may be i m wrong but logic suggest so. 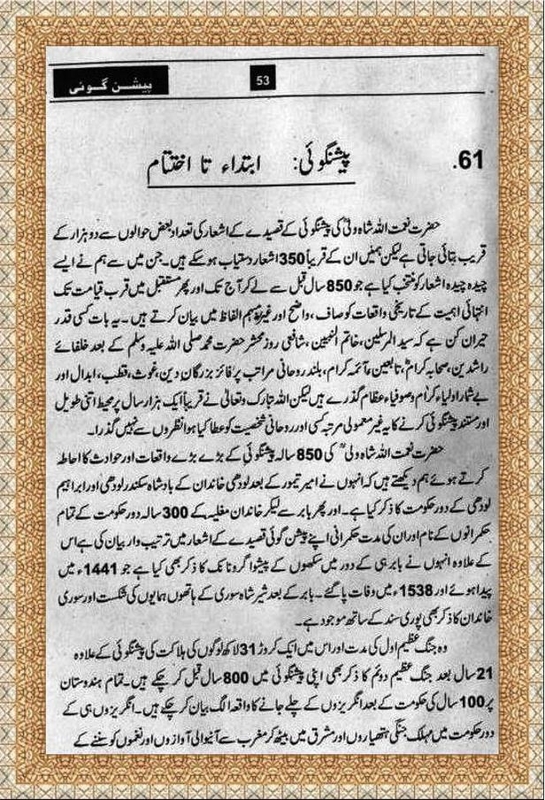 Your previous article 'Aik Rooh Parwar Khat' has few comments and in this article many comments are posted in half day....:) Last article was about knowledge & thoughts, and this article has only one controversial issue about role of army for future planing. We are not discussing whole article but only this controversial point. It proves that we feel happiness in controversial issues and showing our anger against our own people. All Prophets (A.S) built great societies on based on love and peace and I believe Imam Mahdi (A.S) and Prophet (A.S) have come with love and peace. So we are in blessed age and blessed part of Ummah. We shouldn't worry about our future. It has written by Allah, and it will be done exactly as it is written in Loh-e-Mafooz. Not only future is unseen (Ghaib) but our past is also unseen. Allah gives knowledge of his unseen to his messengers and Auylias. So He gave not only knowledge of future but also knowledge of past to His beloved friends. 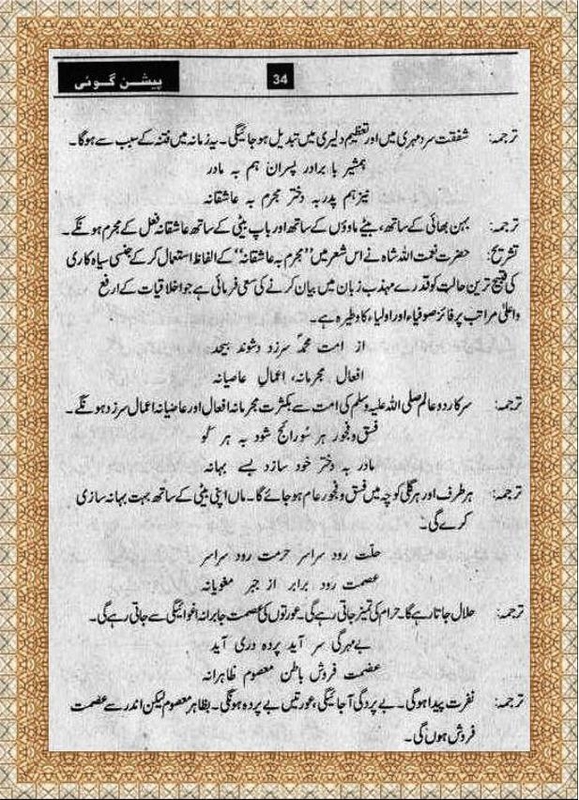 Hazrat Naimatullah Shah Wali (RA) has two sources first is Ahdith of Prophet Muhammad (saw) and second his Kashf/Inspirations. Like Dajjal will ride on Donkey. It is also present in Hadith with more detail. This donkey is today jet fighter plan. 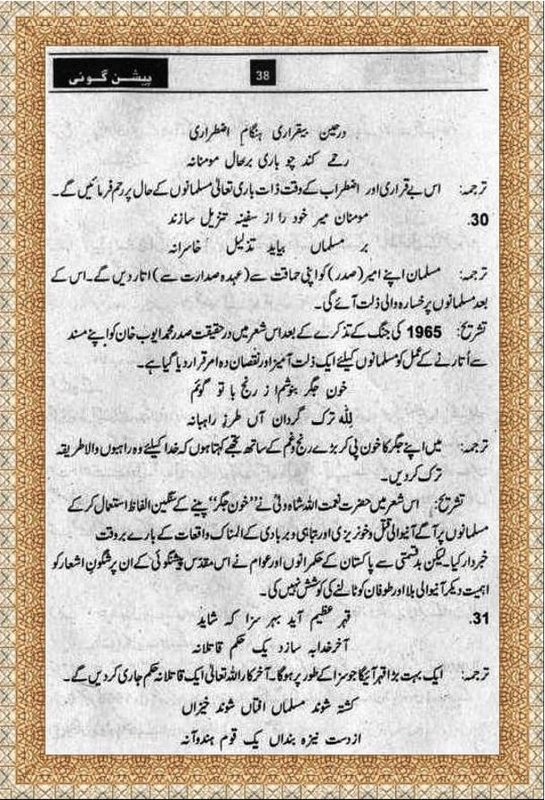 Muslims also misused his (RA) predictions like I read a similar book in 2008, written in 1972, which tried to show Zulfiqar Ali Bhutto as 'Maghrib ka Badsha' king of west. 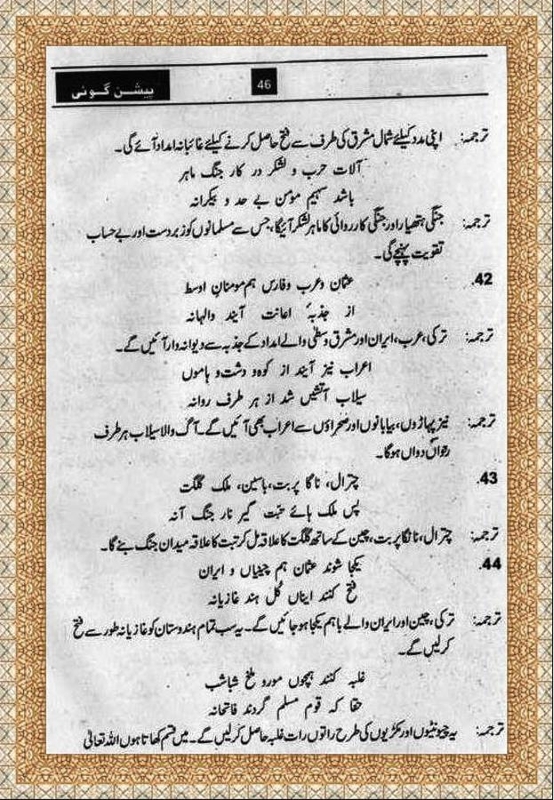 In one prediction Naimatullah pridected two 'Ahmed' will corrupt Islam. 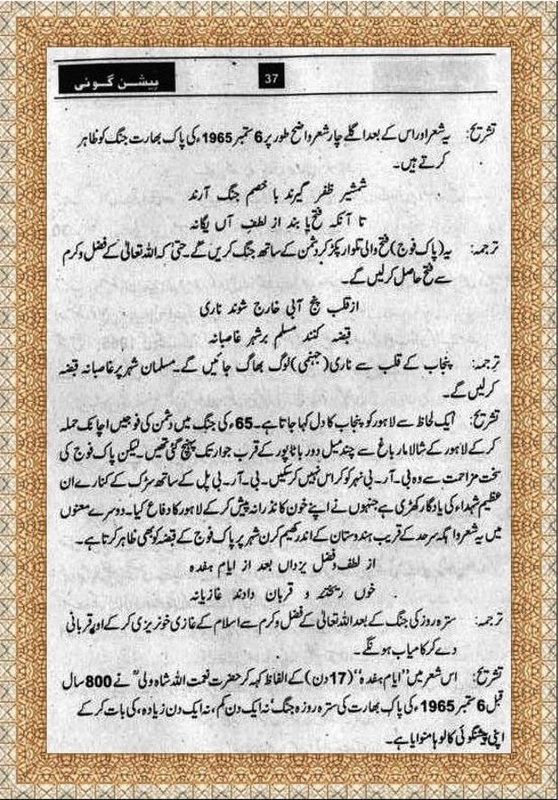 In a thread some people belonging different sects were discussing/fighting that one Ahmed is Mirza Ghulam Ahmed and who is second Ahmed? they concluded following names of today's renowned scholars... Ahmed Raza Khan Barelvi, Javed Ahmad Ghamidi, Dr. Israr Ahmed.... So they misused his prediction to show their hate. Author of above book also show hate against king Auregnzeb. Prophecy Research Center is good idea for future planning but they can also misuse or wrongly interpret predictions as pureness of ego is required for interpretation. This center can be successful if they concern valid and authentic Auylias to understand these predictions. Yes Bro, our people love controversies :) , but in this confusion we have to find our path otherwise we all will be lost in this dust. Anticipating this I started this blog and still working. I agree every word of your comment, actually we are lacking spiritual society here, honesty is rare and moral corruption is in abundance........but brother this time has to come, you know this was per-requisite/stage set for a Revivalist/Guide. Once we realize this that time is going to change and everybody needs to re-discover his inner purity (Tazkiya-e-Nafs). InshaAllh things will start to move in right direction after our realization. Wrong Interpretation/misuse issue can be solved by taking opinion from authentic Auliyas (Sahib-e-Hikmat people) as you said and a team of honest, unbiased and impartial people can easily do this. Issued between diff. sects of Muslims are minor and of ritual type, we must unite for a greater cause. I read two predictions on page 29 which I missed in other books. 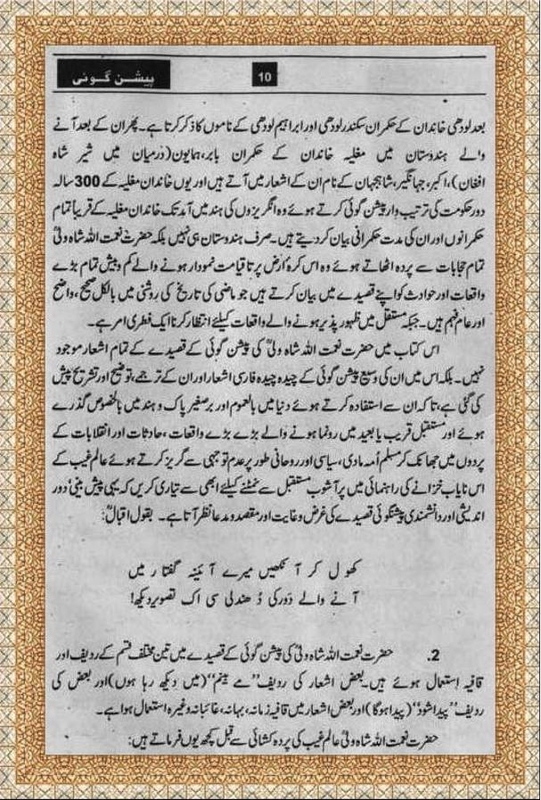 It is about 300 years period of Mughal empire... "you will never see empire of family of Mughals after 300 years. 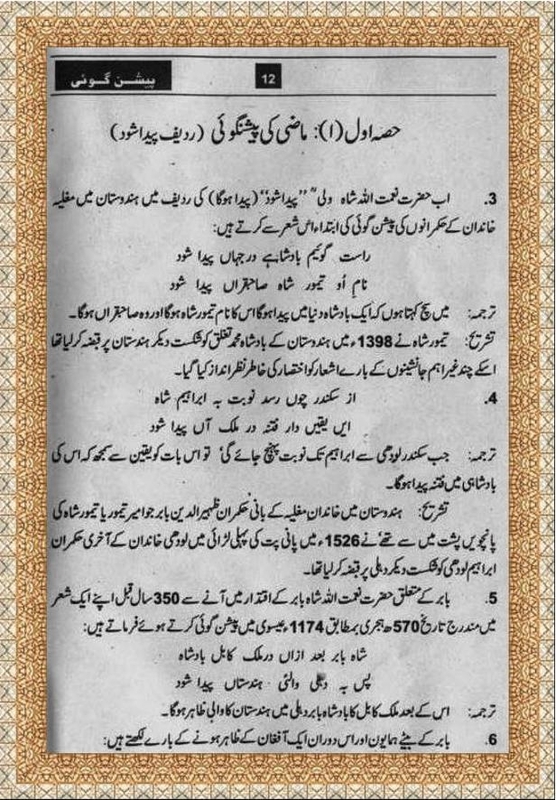 They will be invisible/hide like companions of cave (Ashab e Kahf) in a cave"
Mughal ruled over India more than 300 years (1526-1856=330) and according to history Ashab e Kahf lived in cave for 150-200 years. 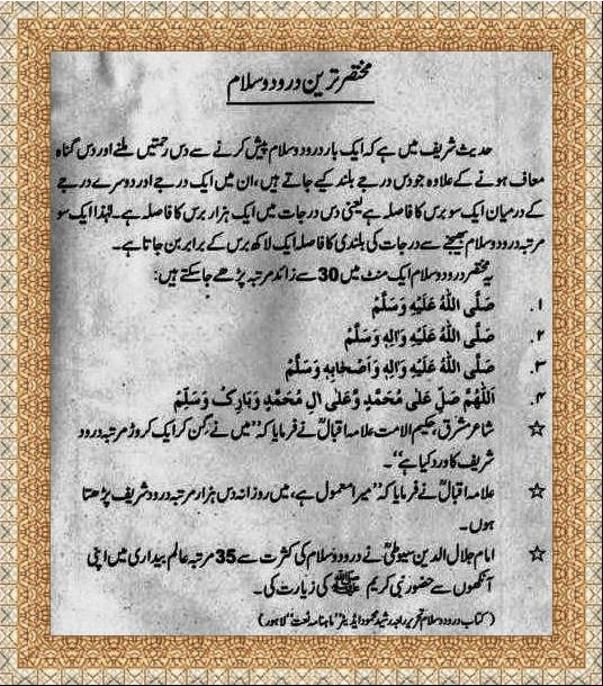 Quran says they slept for 300 years, plus 9, which could mean 300 solar years or 309 lunar years (300 solar years are equal to 309 lunar years). However, Muslim scholars debate whether the timespan given in the Qur'an refers to the actual time spent by the sleepers in the cave, or rather to a timespan being alleged by those who were telling the tale. Some Islamic scholars said they are dead but some said they will awake in time of Mahdi to help him and then they will die till Day of Judgment. 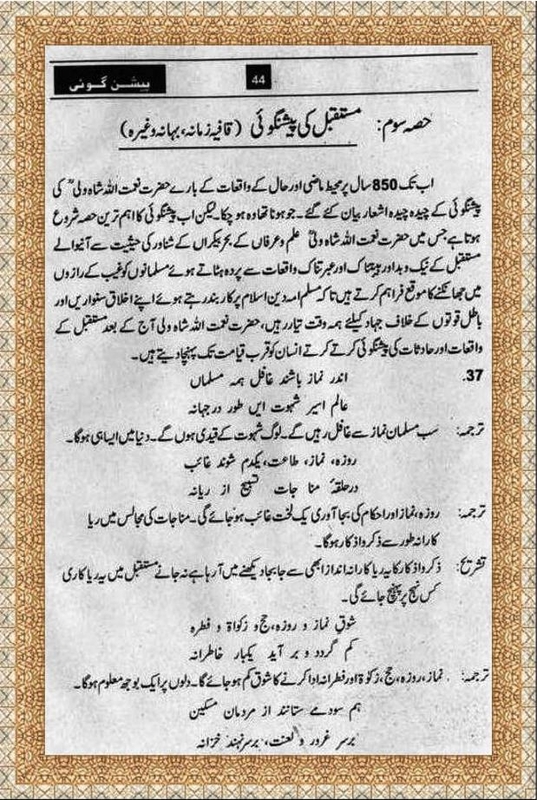 If we believe they slept for 150-200 years it means they will help Mahdi after 150-200 years of Mughal Empire. 1857 + 150->200 = 2007->2057 approx. It is our age. One Hadith says helper of Mahdi will be Turk. Mughal Empire was part Ottoman Caliphate. 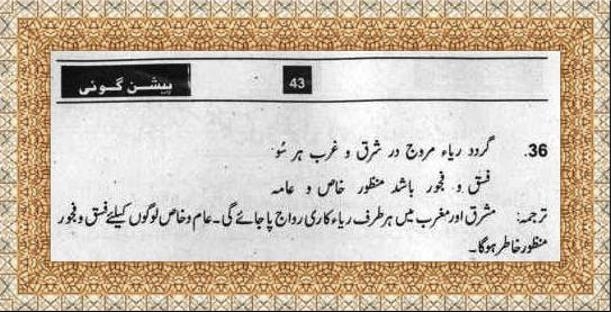 Mughal considered themselves children of Turk and Mongol. 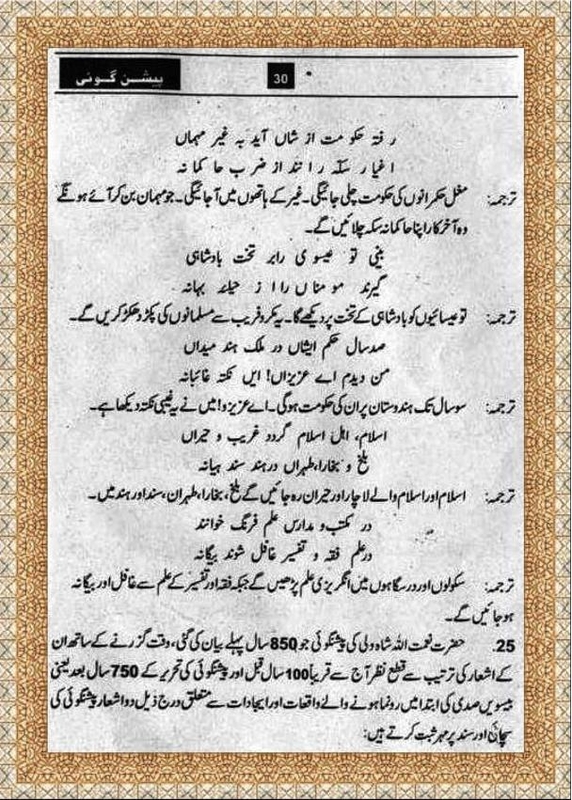 At time of Prophet (saw) homeland of Turks was Khurasaan. Know their children are present in Anatolia (Turkey), Iran and Hind. Yes Faqar... The only reason of the invasion of Iraq and Afghanistan by USA was the concern of USA for the emergence of Hazrat Mahdi (as). PRESENTER: One of our viewers has said that it is related how the more Hazrat Mahdi (as) was exposed to the oppression and cruelty of the antichrist, the better he realized that this was indeed the antichrist. ADNAN OKTAR: Yes, that is in the hadith. PRESENTER: Yes. They say, "Are we to understand from this statement that the alleged Ergenekon organization is emerging further into the daylight every day since it is an institution of the antichrist established to oppose the system of Hazrat Mahdi (as)?" Jewish origin Nostradamus' astrological occultations weren't/aren't true. Most of them are so ambiguous if read in the original languages, that they could fit many scenarios. that he is waiting for incident when Muslim will get Arms and they will do some offensive. INFACT, THIS HAS ALREADY HAPPENED. Pakistan did atomic blast on May 28th, 1998. 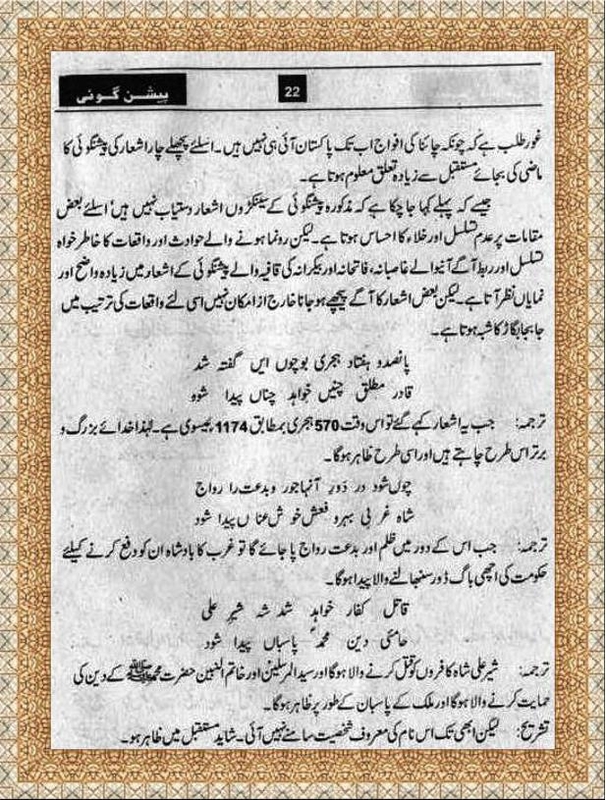 If you find the corresponding Islamic date on 28th May, 1998, You will find it is 02 of Safar 1419H, just after 2 days of Moharm end. But I have calculated this date through some online available calenders (http://www.islamicfinder.org). So there is a chance that actual date on 28th May was 30 Mohrram as there is always difference of date from calendar. 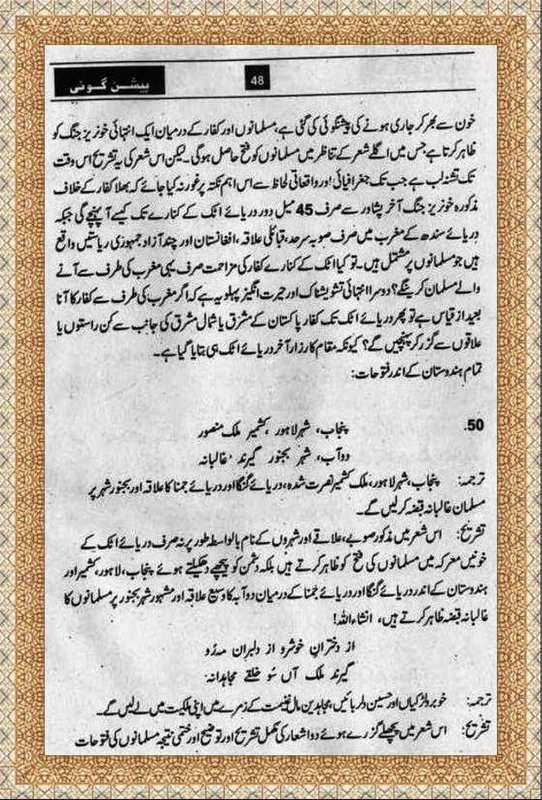 Even if you consider this 02 of Safar, then it is quite obvious that Pakistan has planned and deployed the atomic setup in Chaghi in the month of Moharram. It was ready to be lauched at any time. Mentioning of Arms in the given verse definitely points to some critical arms like Atomic bomb. 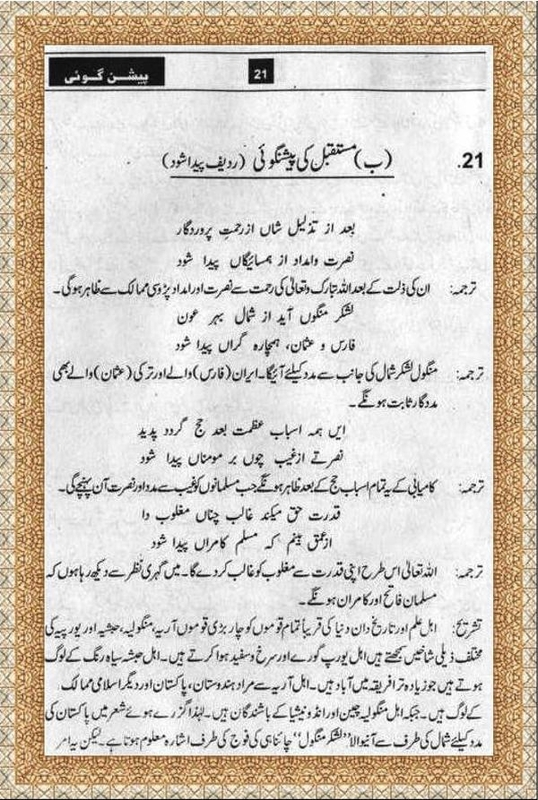 Second important thing mentioned in the verse is that "Muslim will perform some offensive step". This actually points to Kargill war which happened just after one year of atomic blast. 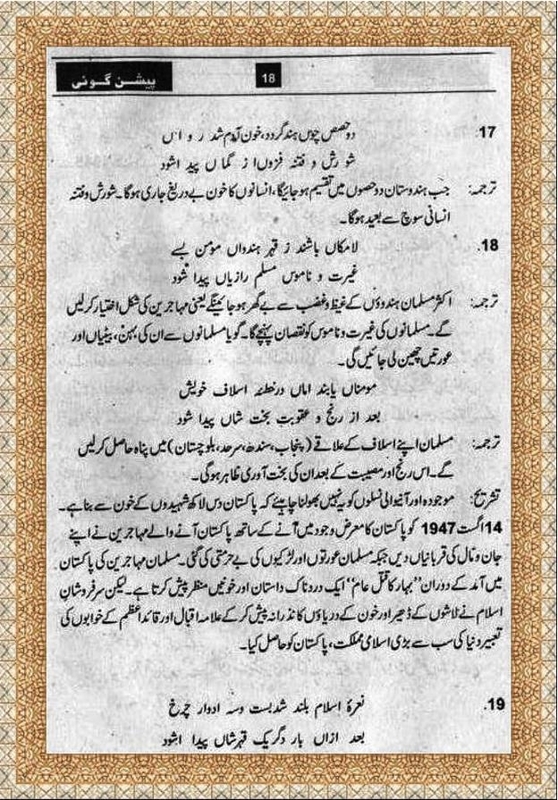 Interesting Kargil war started on 08 May, 1999 and Hijir date is 22nd Moharram 1420. 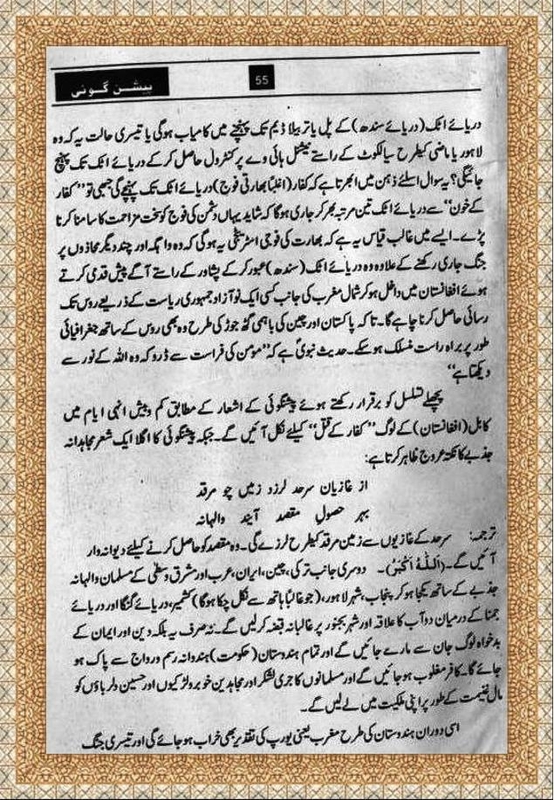 Kargil war was initiated by Pakistan army/Mujahideen. So it was an offensive act initiated by Muslims mentioned in the given verse. This is just what I could interpret. Rest of the Knowledge remains with Allah. c- Even media sp. Kashif Abbasi in talk with Sh. Rasheed, have turned very pro govt. & questioning the credibility of M Ijaz sans the bb record. My Q is that what was he need of all this furore for the past two months if nothing concrete came out of it. I need a healthy dose of optimism!!! Its all for the betterment of our future. 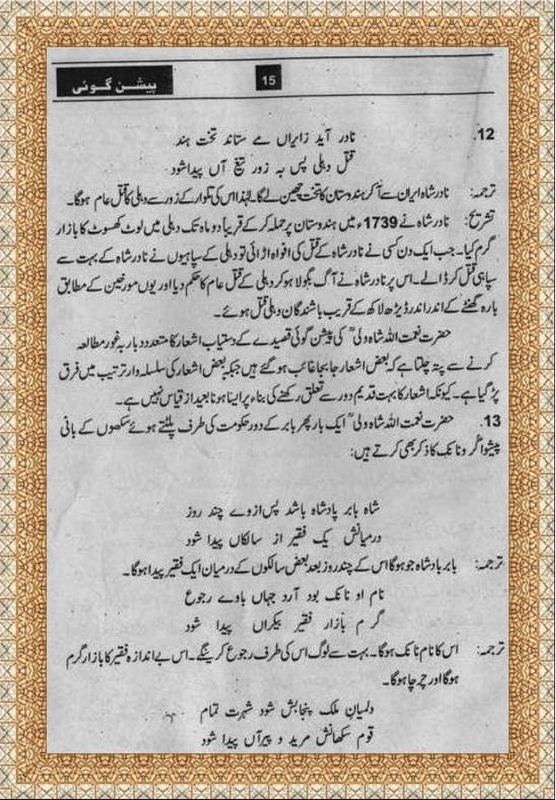 As you know, there are so many spiritual fortellings/predictions in this blog but these things will appear into the world with physical resources (Dunyavi Asbab) and cause n effect. You can think about it in this way that there is a soul in spiritual world but it needs a physical body in materialistic world to appear as a living entity. You have to trust on Allah who is running this world, Allah better knows how and from where to bring change. I again n again posted, situation of country will go on worst until that savior will appear. Its Allah's Order and no one can stop this even all enemies come with their full forces. Allah alone is more powerful than all. i thought this site is best for spiritual knowledge, pls write on the above mention topics.It will be help full to the people whome r away from spirituality. that will be a great job . I just want to share my dream which was not complete but just a glimpse. I saw people were gathered in a ground like place and looking somewhere. Someone told me to look, I look and saw there are few horses standing and some people are on the horses. The strange thing is the horses are so big that I have to raise my head and can't even see the full horse. The rider of the horses are not visible. Horses color are kind of dark grey or like black. But what amaze me is the size of horses. "If one sees a horse whose owner is not known entering a town in a dream, it means that a noble person will enter that town..."
you are waiting for the appearance of Mahdi alaye hi salam.You are waiting for an age of miracles which will come inshaAllah very soon. Keep the right path and keep doing the noble deeds and keep intentions to support Syedna Mahdi alaye hi salam ,inshaAllah you will be rewarded. Faisal and Hussain, thanks both of you. 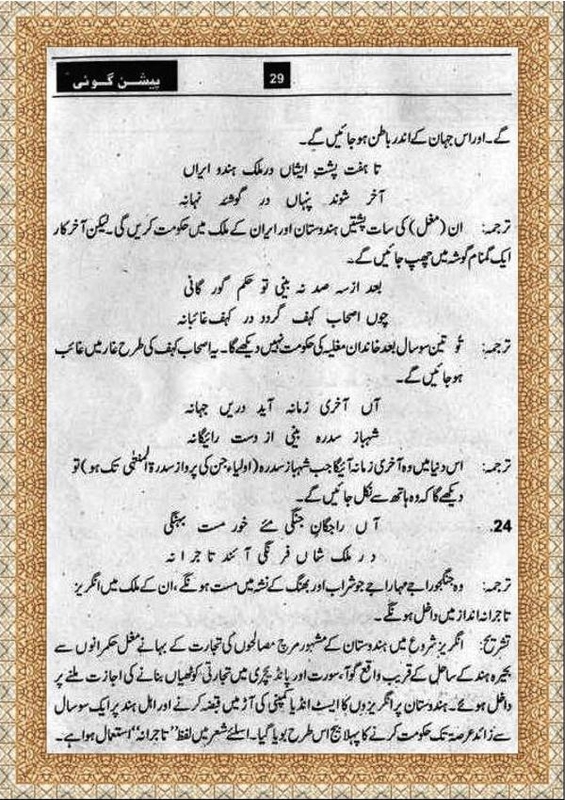 Well I am a gunahgaar insaan and if Allah grant me to become one of the soldier in Imam's lashkar, I would be grateful. What is the authentication of this book? I think it is more like a propaganda stunt. BTW there is a big propaganda department in GHQ and ISI. Infect they have the biggest propaganda machinery in Pakistan and these types of books are published inorder to justify there mess they cause. Agreed . But, I don't believe all of it is done by our agencies. 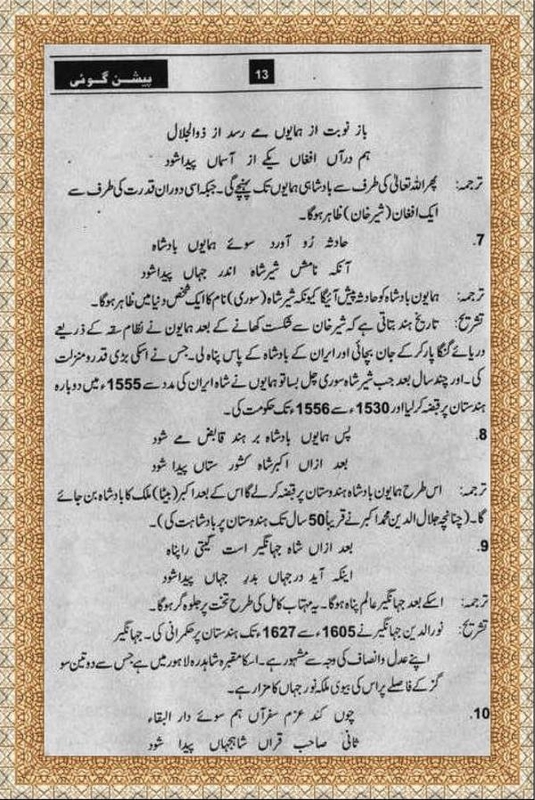 One of my elder had discussed about these predictions in around 1960. I was a high school student then. Since I did not see the book itself, I can't say how many predictions are added later on. 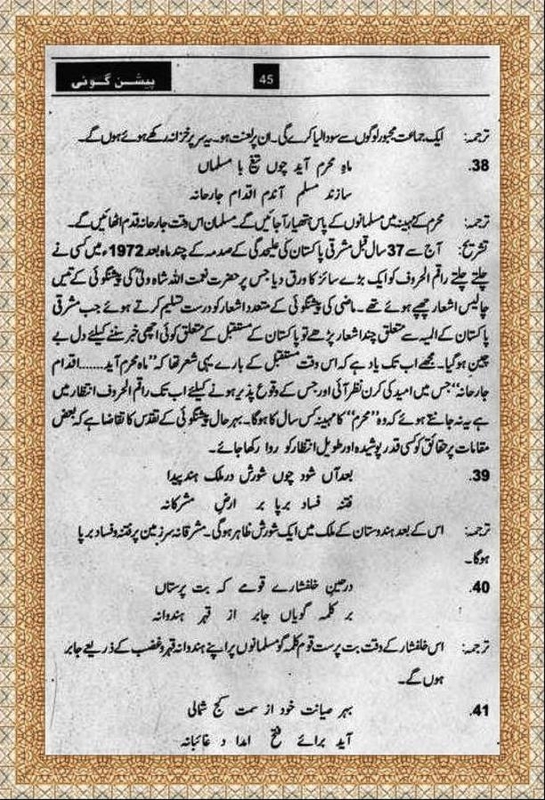 But these predictions did exist even before the partition. 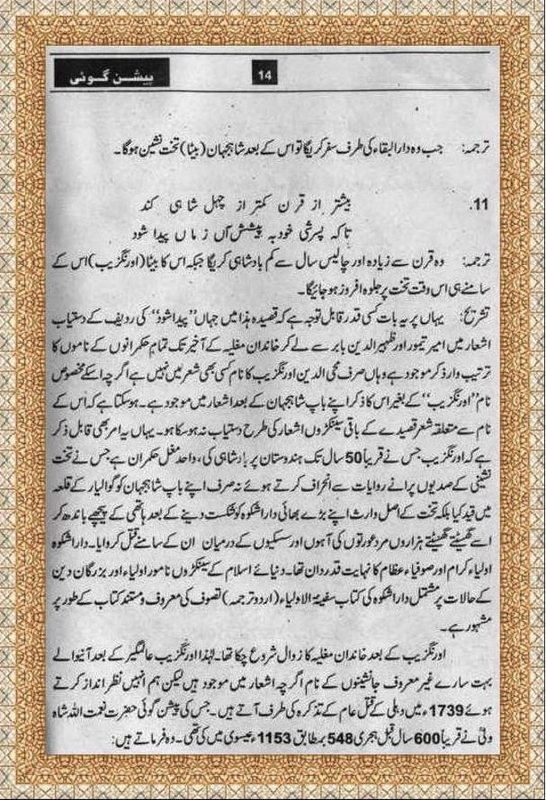 Brother Malik pages 125-128 is start of chapter 5 of book which is "Zahoor Mahdi Tarteeb Zamani Key Sath Waqyat key Tanazer Main". 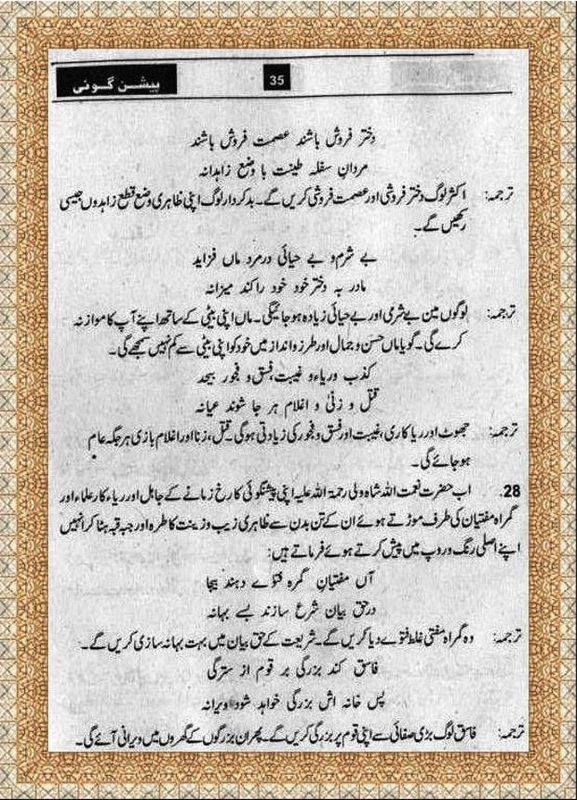 It is good collection of Hadith about last events of appearance of Mahdi at Mecca like wars of Sufyani etc. 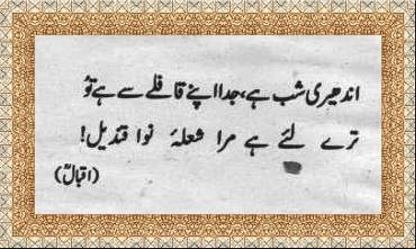 It is not talking about Allama Iqbal. I think writer commented about Allama Iqbal out of context. 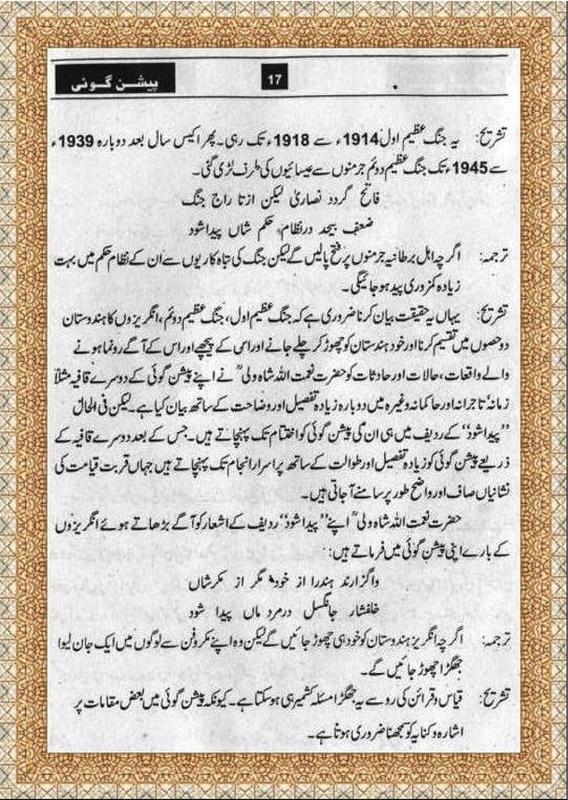 In beginning Qadiyaani effected Allama Iqbal as said his son Javed Iqbal but Allama Iqbal changed his views about Qadiyaani. 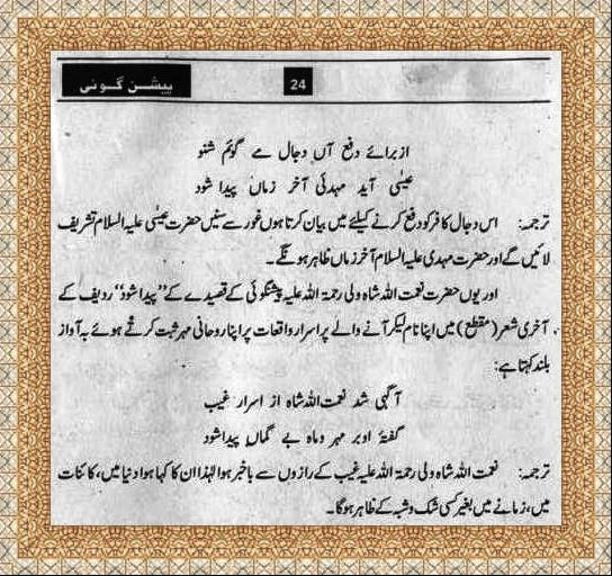 Allama Iqbal didn't denied Mahdi but only said to not wait him ONLY and do efforts. 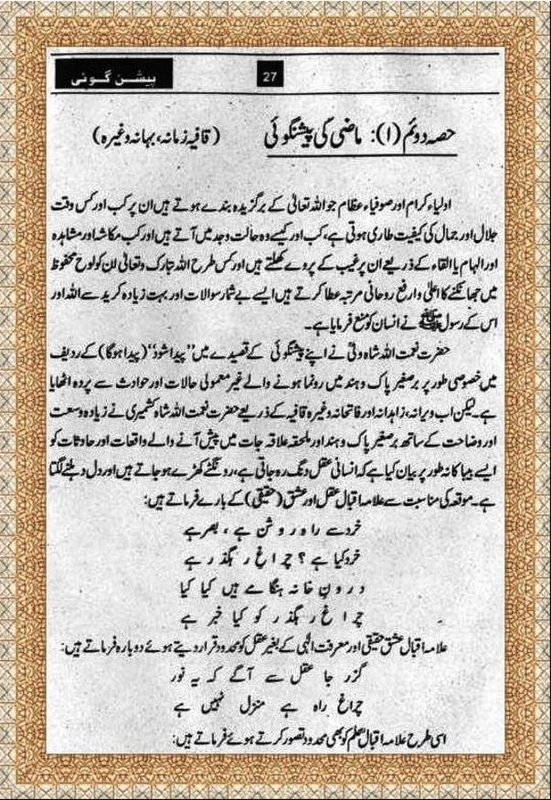 Allama Iqbal denied the thinking of Muslims about Mahdi and Isa (AS) that they will bloodshed and kill many people to control over the world just like Jews think that King Massiha will kill all non-Jews and will give them control all over the world. 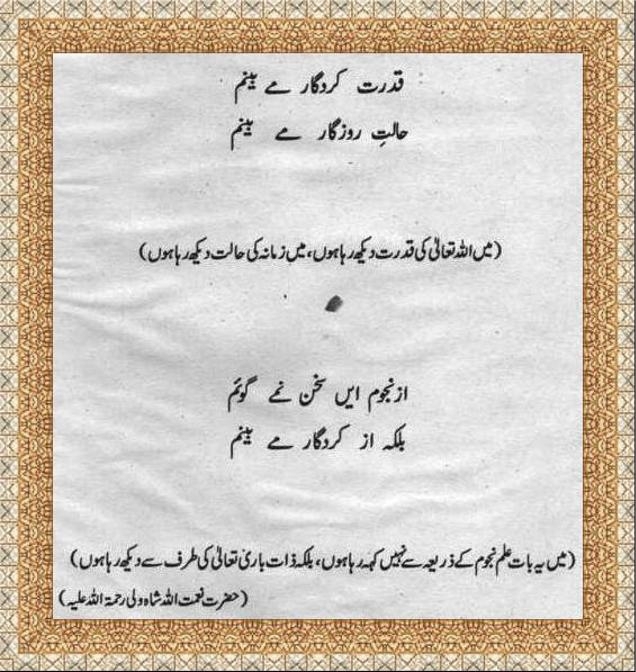 This type of thinking is present in Muslims too about Mahdi and Isa (AS) which Allama Iqbal denied. Book is good for reference. 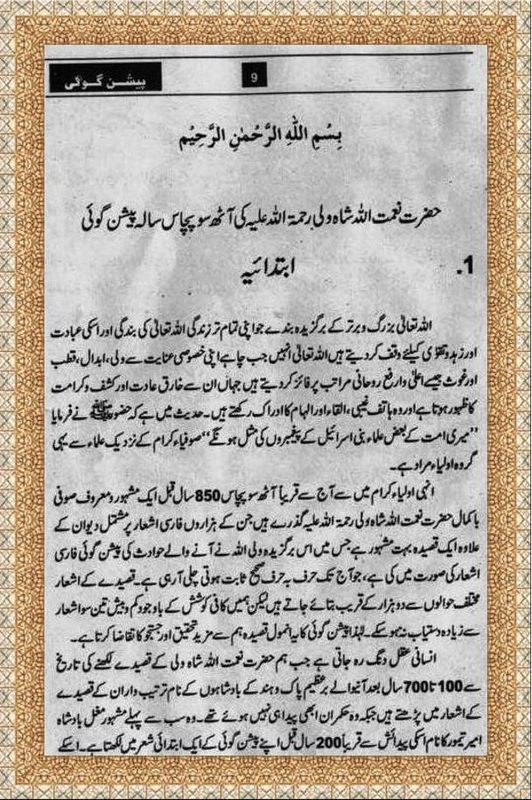 I checked that link and read that page 249 about Allama Iqbal's view about 'Imam Mehdi'. It is totally wrong. 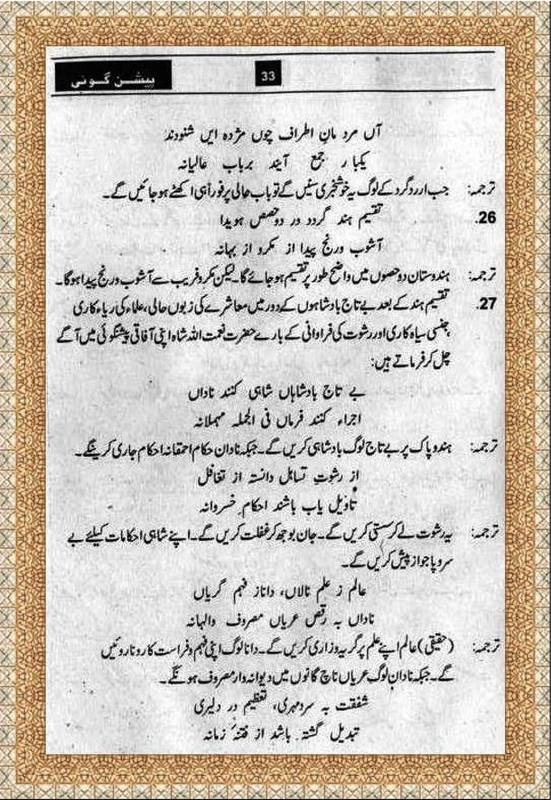 That Verse is not of Allama Iqbal. 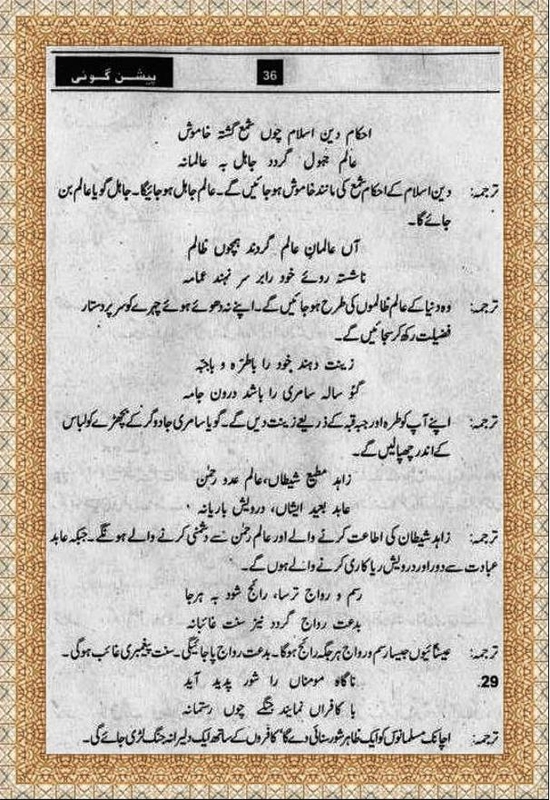 I am shocked why author added that fake verse (shair) which is not of Allama Iqbal. 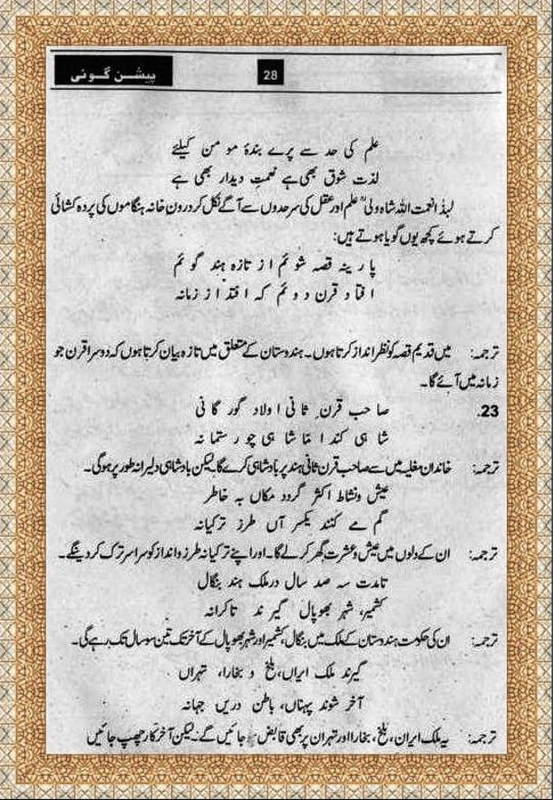 Malik Allama Iqbal ke bare mein galat likha hai, ye shair Allama Iqbal ka nahin hai, isliye agay jo bhi likha hai woh galat hai. 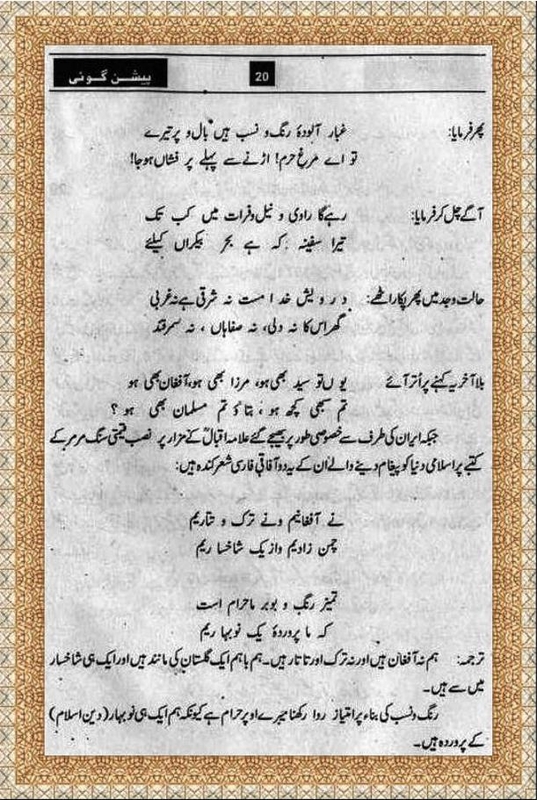 Mein aap ko likh kar de sakta hun, ye shair Allama Iqbal ka nahin hai. 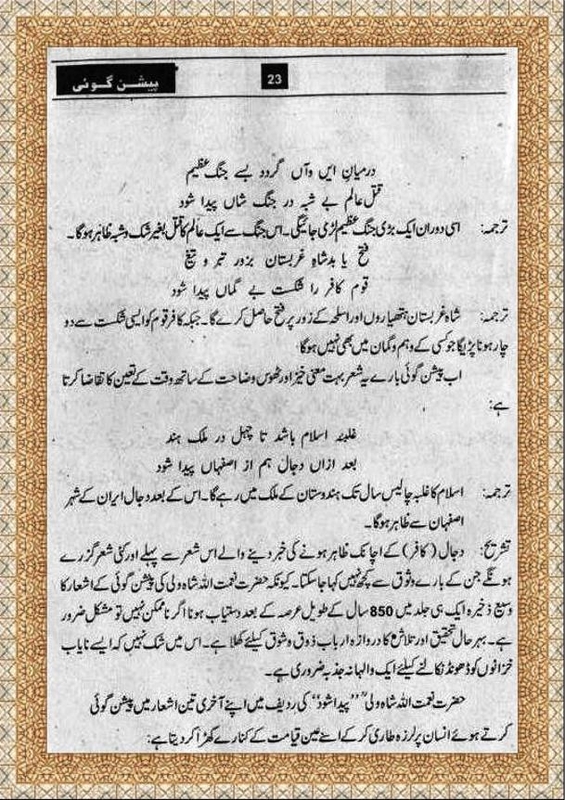 App IqbalUrdu blog par search kar lain ye shair nahin hai. 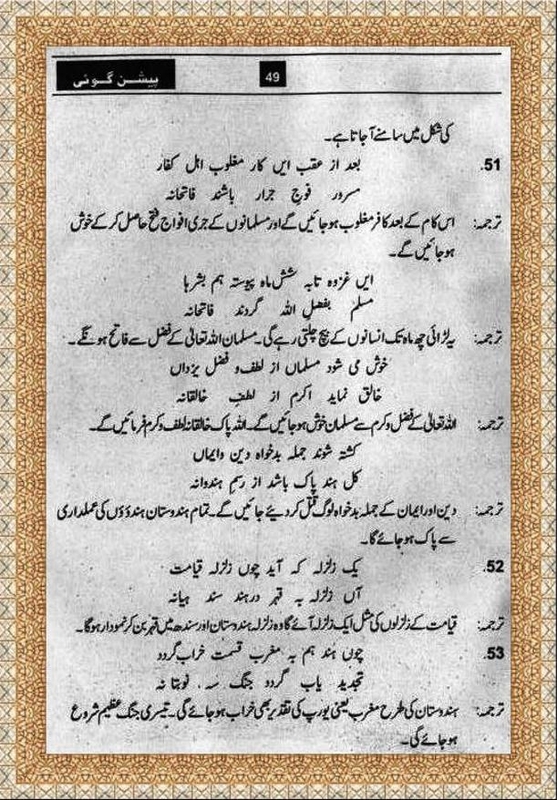 Allama Iqbal ki poems 'Mehdi' par hain, Allah Iqbal Mehdi par yaqeen rakhte thay magar woh kehte thay k saath saath sub mehnat log karain, hath par hath rakh darh kr na baithain. 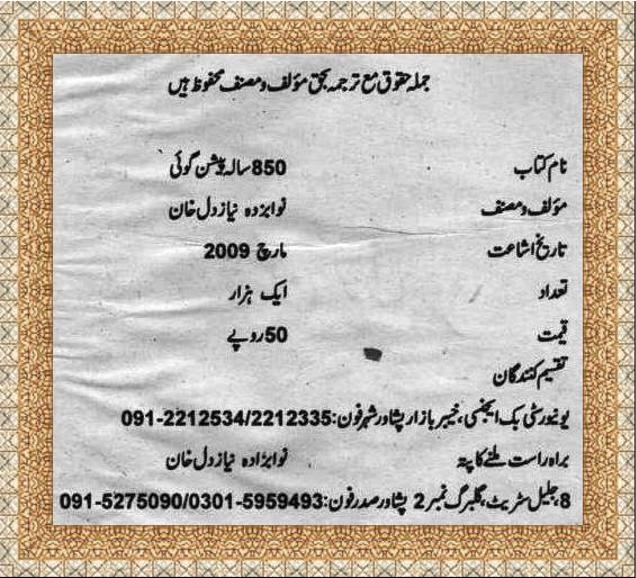 Mein complete tashreeh post kr dun ga.
can any one advise me where i can get the English translate book? 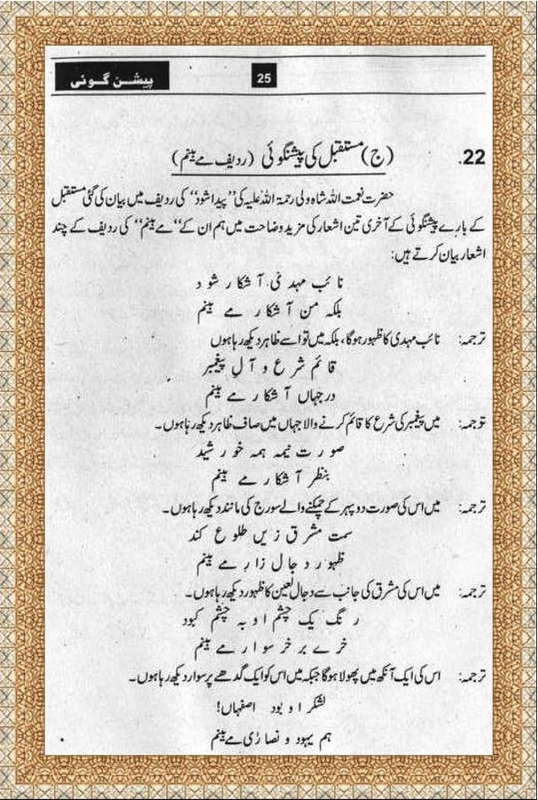 orang zaib alamgeer k mutaliq app ki psot jhoti han ya ye post jhoti han??? ?jo link nechy dia gia ha? wooooow kia bat ha mujh ko samjh nahi ay is mian aorangzib alamgeeer k mutaliq jo likha kia app ny jhot likha ha ya inho ny??? Allah k bad Pakistan ko Army or ISI he chala rhy ha, Govt to America ke ghulam ha, agr Army or ISI na hoty to Govt kab ke Pakistan ko America ko baitch(sell) kr chuky hoty. THINK ABOUT IT. bil furz shah naimatullah nay so called qaseeda no likha hota tu him his tharay moujuda halat per react kirty????? Looking forward to the glory! I think, verse 39-40 on page 45 is about Bombay attack. Allah knows the best. 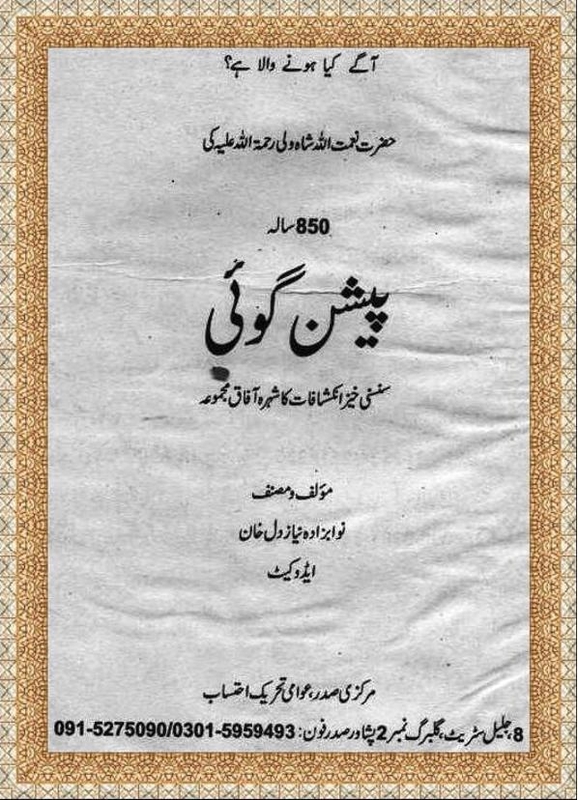 How this book was unearthed after such a long time??? I wonder, who unearthed this book after such a long span. These predictions are present in our family from generations. Well one thing is for sure: Earth will be cleansed from America and Hindus, the ones who have been causing belligerence. wahan ham plaza bnaingy... or sabzian ugaingy....tarboz bhi. :) maza aaeyga. 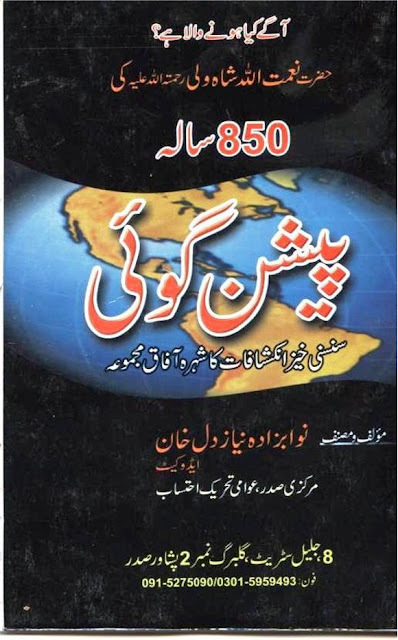 Is any english version of this book available, I cant read urdu, If any english version available please give a link. Allah helps those who help themselves.. 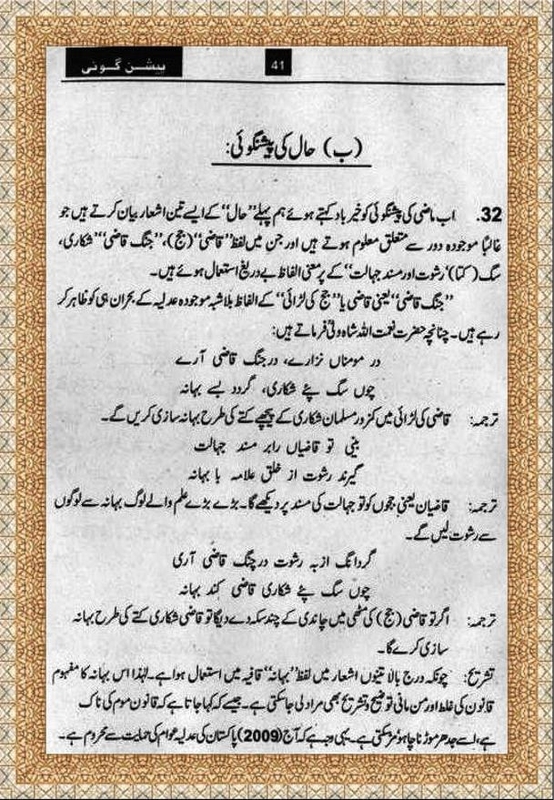 I salute to Pak Army n ISI. N to all patriots .. N all shohda. Lakh di lannat howay jo Pakistan r Islam k dushman hain.